It’s so fun to see all the Spooktacular September posts over here — we love Halloween! 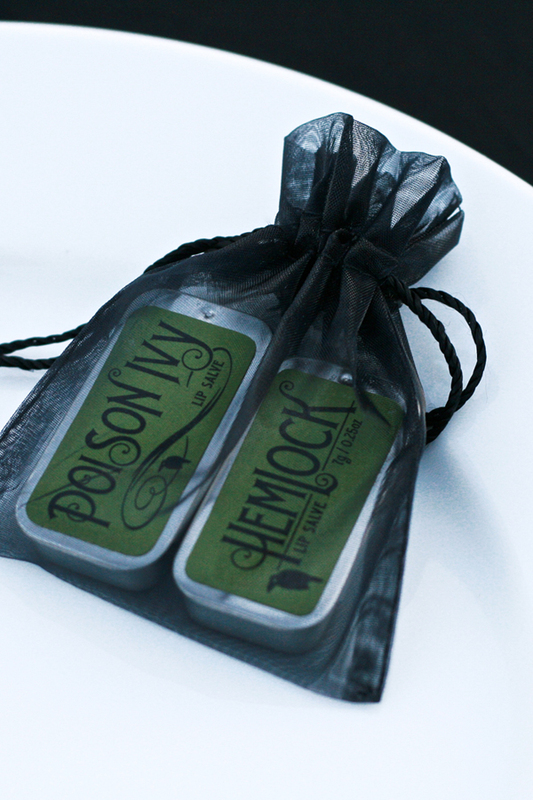 Today we are here to share a recipe for Poison Lip Balm along with free printable tags. 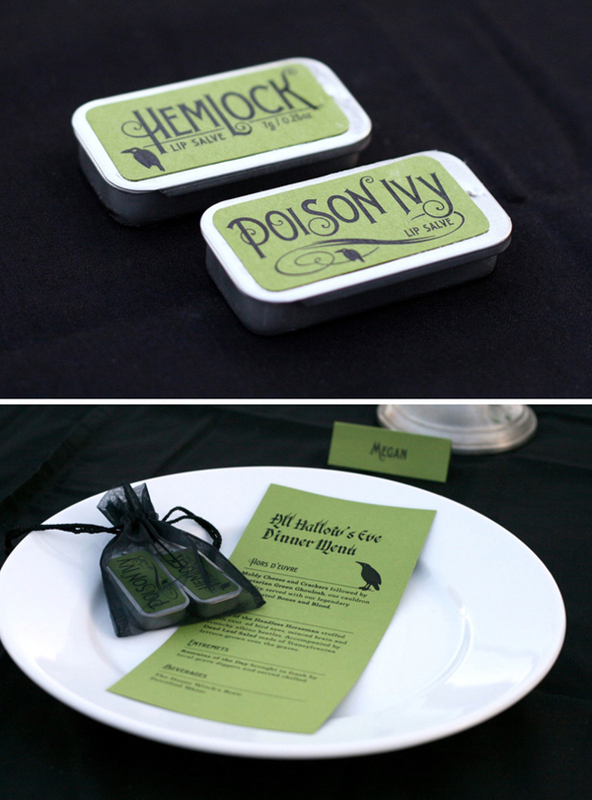 Every year Bettijo and her husband host a All Hallow’s Eve Dinner Party. A few years ago she packaged up homemade lip balms as if they were made by a friendly witch. You can do the same using these tins, our free printable label template and the lip balm recipe below. Not many people realize that Bettijo has a line of natural and organic spa and bath products. Her goodies have been featured in lots of magazines, so we know you’re going to love having her simplified lip balm recipe. We also included the ingredient’s weights since it’s easier to be precise if you use a scale to measure. This recipe will make 7.5 ounces, enough to fill about 30 containers. Feel free to adjust the batch size as needed. Measure Coconut Oil, Beeswax and Olive Oil into a glass measuring cup. Microwave at half power for one-minute intervals, stirring in between with a metal spoon or fork. Repeat until beeswax is melted (usually about 2-3 minutes depending on batch size). Once mixture is melted, let stand (to cool slightly) for 1 or 2 minutes and then add the Essential Oils and Vitamin E.
For the Poison Ivy Flavor we used both Peppermint and Marjoram Essential Oils but you could also just use Spearmint. For the Hemlock Flavor try Bergamot or Orange. You can find essential oils at a health food store, some supermarkets or online. Mix well and fill into containers. A little dropper/pipette is handy for tranferring the lip balm mixture into small containers. If we try to pour we sometimes get lucky but usually spill everywhere. If the mixture starts to become solid before you have filled all the containers you can reheat for 30 seconds then continue filling. Try not to reheat too much as you can burn off the essential oil goodness. 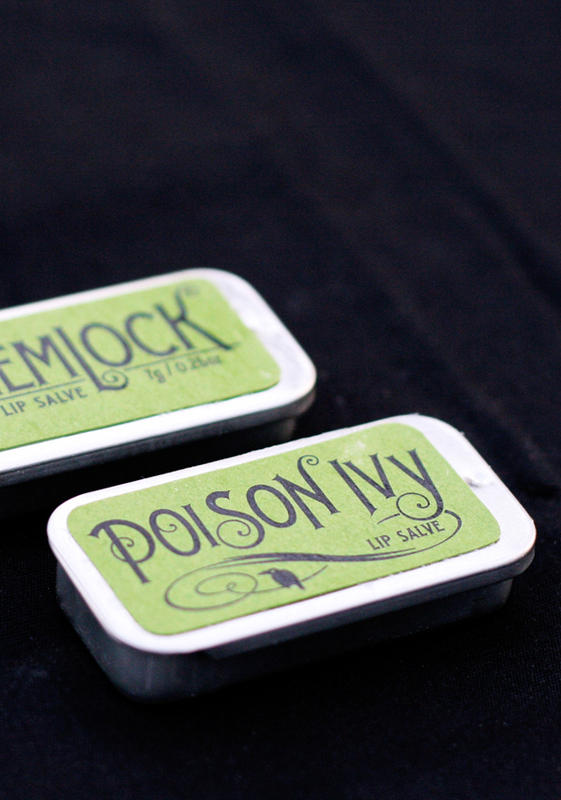 Print our free Poison Lip Balm template on colored cardstock then cut each label out. Run through the Xyron Create-A-Sticker and apply to the tins. Brush a thin coat of decoupage medium like Mod Podge over the labels to make them more durable.